Google’s driverless car gets most of the hype. 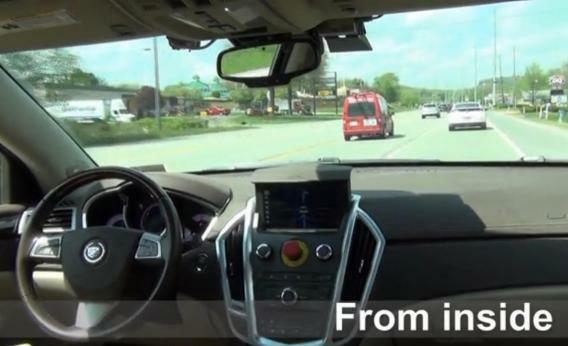 But one of the best looks yet at what it’s actually like behind the wheel of an self-driving car comes to us courtesy of Carnegie Mellon University, which for several years now has been collaborating with General Motors to turn a standard-issue Cadillac SRX into a road-ready autonomous vehicle. Like Google’s self-driving Prius, the Carnegie Mellon car is capable of making its own decisions to speed up, slow down, and stop at right lights. One notable difference: Whereas the Google car’s main, 64-laser sensor sits conspicuously atop its roof, rotating multiple times per second, the Carnegie Mellon car’s sensors are embedded discreetly all around the car. Professor Raj Rajkumar, co-director of the project, told me he thinks that will prove to be a more practical approach in the long run. The first video below shows the Carnegie Mellon car switching from manual to autonomous driving mode on a relatively open stretch of road. For now, this switch is likely to give drivers a little flutter of nervousness as they put their faith in the machine. But at some point in the future, it may signal the point in the commute at which the driver can sigh, relax, and tilt his seat back to enjoy the ride. In the second video, you can see what it’s like to sit behind the wheel as the car navigates through traffic on a busy urban street, Route 90 north of Pittsburgh. It uses object-recognition technology to identify obstacles in its path and communicates with traffic lights to avoid running a red. As smooth as it seems, there are still some improvements to be made. For one thing, the lane changes might strike the average passenger as a little abrupt, as is evident from the video below. Ultimately, Rajkumar said, the car will be programmed to drive in a way that puts its passengers at ease, while giving them the option to select more laid-back or more aggressive driving modes. Just don’t expect it to break the speed limit.